This pair of lamps emerged from our combined enthusiasm for the 'Deconstructed Walnut Lamp' and the 'Green Paulownia Carved Circles Box'. We wanted to make a stylistically different 'deconstructed' lamp (one in which the four sides are only 'connected' to one another via a common base) after recently completing a wild one done in walnut. We elected to lift the motif of overlapping and concentric circles from the green paulownia box and reproduce it to the extent possible using stained glass in a pair of deconstructed lamps. We chose African Sapele for the wood because we wanted an overall glossy look and this wood has a natural sheen that is magnified in this instance by the semi-gloss oil and urethane finish we applied. We also chose it for its beautiful golden brown tones and grains, which marry beautifully with the blues, grays and whites of the stained glass circles, all of which is enhanced by the classic glow of the Edison style bulbs. 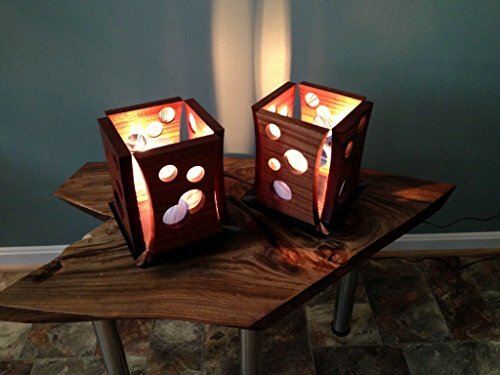 We love the look of this pair of lamps. They have clean lines yet are somehow exotic. The wood grain and the glass look wildly different lit versus unlit and in the changing ambient light conditions. They are lovely on pairs of end tables or night stands, or on opposite ends of a large console table. These lamps are sold as a pair. They each measure 10 1/2 " tall x 8 1/2 wide (square), and include a six foot long cord with inline switch and Edison style bulb.